The current Chickasha Public Library Staff Pick is “City of Light” by Lauren Belfer. 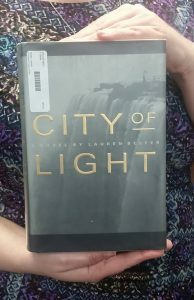 The book “City of Light” is a historical fiction set in 1901. This historical fiction book seemed to be well researched and historically accurate. It was about the efforts to make electricity widely available to everyone at a reasonable cost. Of course, there were many issues to be dealt with, safety and profit being the foremost and then there were all the difficulties of actually making it happen. The setting was Buffalo, NY and the descriptions of the city were beautiful. The time was the early 1900’s. Society at that time did things differently than we do now of course, so that was interesting to read about. It was enjoyable to read and worth a try. The Library’s book club Chapter Chat has read this book and others by Lauren Belfer, and they enjoy her work. The Library and the Oklahoma Virtual Library have copies of this book if you would like to give it a try. If you read “City of Light,” we would love to hear your thoughts; please comment below. The Library Looks Great What’s Next? Have you been to the Library recently? The reason I ask that is because I know we have many e-customers that don’t come in very often. We’ve done some renovating, redecorating, and rearranging. In 2016 we renovated the children’s area, we replaced the flooring and the shelving with wood look items and Carrie Chavers, a local artist, painted a mural on a couple of walls. It looks fantastic. We just finished our latest project which was rearranging and adding additional furniture for our mobile wi-fi customers and teens. The areas redesign has created a spacious atmosphere that compliments the already existing adult seating area. These are the changes happing at your library, and if you have not seen them yet, I encourage you to visit and let us know what you think. There are more than just physical changes happening in libraries. 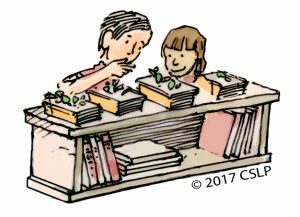 Perhaps you’ve been in other libraries recently and have noticed that there’s a change going on in libraries across the nation. As library users requirements change, it is important for libraries to change to meet those needs. Not only are the interior of physical libraries transforming there is also a reconstruction of library services occurring. Additional electronic resources are being added to allow patrons to access library resources remotely this allow libraries to meet the demand of immediate service and up to date information. I encourage you to give some thought to your library. You might want to take a look at the website https://chickashapl.okpls.org/ and see all of the services we currently provide and what electronic resources are available. Your library is adapting to meet the needs of its patrons, by providing additional databases. This summer the library will add resources such a language learning program and possibly Consumer Reports online. As Chickasha Public Library strives to meet the needs of this community both physically and electronically, we would like to hear your viewpoints and opinions. What do you think about the physical library and the services provided here and what do you think about the electronic resources available? 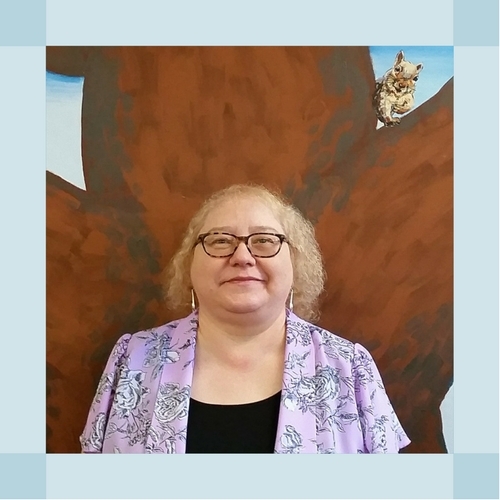 My email is Lillie.huckaby@chickasha.org; you are also welcome to visit with me in person, or give me a call at 405-222-6075, or write me a letter. In the next few newsletters, I will be sharing with you some of the changes that libraries across the nation and especially in Oklahoma are making. Every year the Chickasha Public Library offers a free Summer Reading Program for children and teens. The library’s summer reading program is every Thursday in June and July. The Library will kick off the Summer Reading Program with the sign-up day on May 25th 9:30 to 7:00 at the library, 527 W Iowa Ave. This summer we will be having three different sessions, one at 10:00 am for ages six to twelve, one at 2:00 pm for ages six to twelve, and one at 4:00 pm for ages twelve to sixteen. If a child is twelve, they can choose which group, they want to attend the younger or older program. The 10:00 am, and 2:00 pm sessions will be the same program; the children will only be able to attend one of the sessions, but you can choose which one. We wanted to provide a time for everyone and hope that this additional time slot will allow for more attendance and help with busy summer schedules. All summer youth will keep track of the minutes they spend reading and will be able to earn incentives, the incentives build as the youth’s minutes’ build. Children and teens do not have to attend the program to keep track of minutes; they can bring their reading log in at any point in June and July to be calculated. The Summer Reading Program is different every week; the program will consist of myself or a special guest reading a book to the children, it is important for children to see adults reading. One of the goals of the program is to create a lifelong love of reading. We will also discuss what the children have been reading over the summer, and I will talk about other titles that they might enjoy. We will also have a craft and a game. Thanks to the City of Chickasha, (IMLS) Institute of Museum and Library Service, (ODL) Oklahoma Department of Libraries, and the Friends of the Chickasha Public Library we will also be able to bring in performers throughout the summer for the youth to enjoy. According to the article linked below studies have shown these benefits to be true. If your child has not participated in the Summer Reading Program before I encourage them to try it, reading has the power to “Build a Better World” which is the summer reading program theme for this year. The Summer Reading Program is sponsored by the Collaborative Summer Library Program, (IMLS) Institute of Museum and Library Services, The Oklahoman Newspapers in Education, Sonic-America’s Drive-In, Corp, (ODL) Oklahoma Department of Libraries, the City of Chickasha, and the Friends of the Chickasha Public Library. Volunteers are essential to non-profit organizations. Most non-profit organizations find themselves in a constant struggle to survive. They must continually search for sources of funding. Their first priority is to underwrite the activities of the group’s mission. A shortage of paid staff is a problem for many of these organizations. This issue is why volunteers are so important. The definition of volunteer is ‘giving unpaid help to an organization or group.’ This area of day-to-day help is most in need of volunteers. Helping at a special event is easier because it is a short term commitment and tends to be more social in nature. Unfortunately, the number of volunteers have been in decline for some years. One problem is that they are aging out. Volunteering was once an important part of a community’s society. Today women, who traditionally form the largest volunteer base, are working full time. Retirees frequently volunteer to have something to do or somewhere to go. Students can also be a good group of volunteers. Often they are in need of credits for achievement or to fill out their resume for college application. Regardless of the organization or whether volunteers are working a single event or have an ongoing commitment, they feel good about helping. The “feel good factor” is determined by a sense of advancing the cause of the organization and a sense of making a real contribution to its success. Volunteers do not keep coming back if they do not have a sense of being valued or if they do not enjoy the experience. Providing valuable work is something that non-profits work at trying to provide for their volunteers. Non-profits are always in need of volunteers. A volunteer is of help regardless of their ability or time commitment; whether they can give an hour or a week; whether they can schedule a regular time or are just available from time to time. If you think you would be interested in volunteering, you will find a heartfelt welcome at any organization you choose. Where does your interest lie? If you are interested in animals, you could walk the dogs at the shelter or help with the pet adoption group. If you believe in public education, join the school foundation. If you love to read and believe that libraries are important to communities, give them a call. These groups and others would love to hear from you. Randle, Melanie, and Dolnicar, Sara. “Attracting Volunteers in Highly Multicultural Societies: A Marketing Challenge.” Journal of Nonprofit &Public Sector Marketing, 24:351-369, 2012. Below is a link to the library’s database EBSCOhost the article can be viewed through this database. This source can be viewed through the library’s database EBSCOhost, If you have trouble accessing this source please call the library at 405-222-6075. This year marks the 150th Anniversary of the beginning of the Chisholm Trail. During its time, the Chisholm Trail was considered one of the wonders of the Western World. Jesse Chisholm, a part-Cherokee, who built a trading post in what is now Oklahoma City is who the trail is named after. The Chisholm Trail Heritage Center in Duncan, Oklahoma is a great place for the whole family to learn about the history of the Chisholm Trail. For more information, please visit, http://onthechisholmtrail.com/. Cowboys drove cattle on the Chisholm Trail from 1867-1889. The Chisholm Trail ran south to north parallel to, what is now, Highway 81, a total of 800 miles from start to finish. The trail ran east of Marlow, Rush Springs, and Chickasha. The trail ran west of Ninnekah, Amber, and Tuttle. The trail split in the middle. The Western Trail at the split went to, present day, El Reno, Okarche, and Kingfisher. The Eastern Trail at the split went to, present day, Mustang, Yukon, and Piedmont. These divisions came back together at Red Fork Ranch, now the town of Dover. There are disputes over the beginning of the Chisholm Trail to this day. There are four places where it arguably started. Some say it began in Donna, Texas. Others say it began in San Antonio, Texas. Many say it began in Fort Worth, Texas. While some argue it started at Red River Station, near present Ringgold, Texas, which was at the mouth of Salt Creek in Montague County where the herds left Texas and crossed into Indian Territory. The one thing undisputed is where the trail ended. From 1867-1871 it ended in Abilene, Kansas. Between 1872-1883 it stopped at Newton, Kansas and Wichita, Kansas. And from 1883-1887 it ended at Caldwell, Kansas. After 1881, the drives diminished considerably. Many things contributed to the downfall of the Chisholm Trail, from the Cherokee Strip causing much of the land to be fenced in, to a quarantine law, and even a blizzard that destroyed most of the cattle industry. No matter where the Chisholm Trail began or where it ended one thing is for sure, Oklahoma was the heart and backbone of this great trail. An estimated 6 million cattle traveled the Chisholm Trail during its life with the biggest cattle trailing years being 1871 and 1873. An average of 2500 to 3000 head would move in one herd per trip. On this journey there, would typically be 10 to 14 cowboys, a trail boss, a horse wrangler, and a cook and wagon. The herds would be spread about 10 miles apart, which is about one day. During the drive, the herd would be watered in the morning then slowly graze and eat northward until night. At night, they would stop at a watering hole and bed down. Then they would start all over again the next day until they reached their destination. Many a cattle and cowboy took this long trip during the years of the Chisholm Trail. At the end of the 20th century, the Chisholm Trail was still visible in many places including a spot near Bison in Garfield County, 1.5 miles south of US 81 and 1/3 miles west on a county road. Robert “Bob” Klemme, from Enid, Oklahoma, erected 400 concrete markers along the route of the Chisholm Trail across Oklahoma in the span of about seven years with the help of his friends. He placed the 400th marker, last, on Wilshire Road near Yukon, Oklahoma in September 1997. He also put other markers in Brownsville, Texas, and Abilene, Kansas commemorating the beginning and ending the Chisholm Trail. These markers are still visible to this day. There is something for everyone this year to celebrate the 150th Anniversary of the Chisholm Trail. Some fun things to do is visit an exhibit (photos, documents, artifacts, cattle-trail era items), go to a quilt exhibition, take western swing and dance lessons, have your children star in a western movie, and much more. Please visit www.chisholmtrail150.org/events for a listing and information on local events. The Chisholm Trail is a big part of Oklahoma history helping to make it into the great state we know and love today. Between exhibits, shows, galas, dinners, and more, the whole family can help celebrate 150 years of the Chisholm Trail.